This tutorial is designed for beginners who want to get started with PROC SQL. Also, it will attempt to compare the techniques of DATA Step and PROC SQL. The difference between SAS and SQL terminology is shown in the table below. Note: Only the SELECT and FROM clauses are required. All the other clauses are optional. We are going to look at the difference between Non-SQL Base SAS and PROC SQL. You would hear the word 'schema' from SQL programmers. A permanent library in SAS is the same as a 'schema' in Oracle and 'database' in Teradata. Asterisk (*) is used to select all columns (variables) in the order in which they are stored in the table. Outdata is the table (data set) from which we need to select the columns (variables) . It is stored in SASUSER library. In the SELECT clause, multiple columns are separated by commas. In the SELECT clause, Weight and Married columns (variables) are specified so that we can select them from OUTDATA table (data set). Suppose you want to limit the number of rows (observations) that PROC SQL displays, use the OUTOBS= option in the PROC SQL statement. Suppose you want to rename a variable, use the column alias AS option in the PROC SQL statement. The variable name has been renamed from married to marriage. Suppose you want to create a new variable that contains calculation. A new variable has been created and named newweight which is calculated on the basis of the existing variable weight. The keyword CALCULATED is used to refer a previously calculated variable. The keyword DISTINCT is used to eliminate duplicate rows (observations) from your query results. In the following program, we are asking SAS to remove all those cases where in duplicates exist on combination of both the variables - weight and married. The DISTINCT * implies cases having same values in all the variables as a whole would be removed. SAS-defined formats can be used to improve the appearance of the body of a report. You can also label the variables using LABEL keyword. 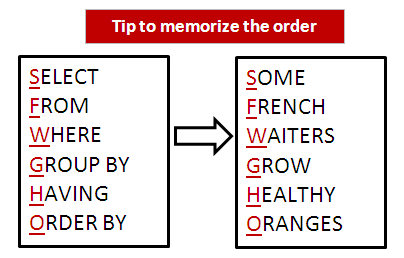 The ORDER BY clause returns the data in sorted order. ASC option is used to sort the data in ascending order. It is the default option. Use the WHERE clause with any valid SAS expression to subset data. The BETWEEN-AND operator selects within an inclusive range of values. The IN operator selects from a list of fixed values. The IS MISSING or IS NULL operator selects missing values. The LIKE Operator is used to select a pattern. 2. Repeat the calculation in the WHERE clause. The END is required when using the CASE. Use GROUP BY clause to summarize data. Summary functions are used on the SELECT statement to produce summary for each of the analysis variables. 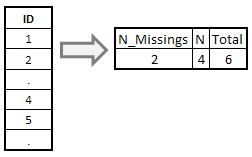 In order to subset data when grouping is in effect, the HAVING clause must be used. The variable specified in having clause must contain summary statistics. The WHERE clause cannot be used with the GROUP BY clause. To subset data with the GROUP BY clause you must use HAVING clause. The CREATE TABLE statement can be used to create a new data set as output instead of a report produced in output window. Suppose you want to limit the number of rows (observations) that PROC SQL produces in the data set, use the INOBS= option in the PROC SQL statement. Suppose you want to calculate number of students who have got same scores by their college names. You can use PROC SQL with COUNT(DISTINCT variable_name) to determine the number of unique values for a column. You can use NMISS() function to compute the number of missing values in a variable. The COUNT() function returns the number of non-missing values in a variable. The keyword CALCULATED is used to refer to a newly created variable for further calculation. In this case, we have used CALCULATED to sum 'N_MISSINGS' and 'N' variables. Suppose you need to keep all the variables from SASHELP.CARS except variables 'MODEL' and 'MAKE'. The DROP= option is used to drop these two variables. Similarly, we can use KEEP= option to keep specific variables. These DROP= and KEEP= Options are not native SQL language. It only works in SAS. You can use DELETE FROM statement to remove records (rows) from a dataset. In this case, we are deleting all records having value greater than 20 in var1 from mydata dataset. Find employee IDs who have records in table file1 but not in table file2. Find employee IDs whose age is in the average age +/- 10 years. 44 Responses to "Lesson 1 : PROC SQL Tutorial for Beginners (20 Examples)"
Well Done Deepanshu, I was almost new to SQL. But Now I can say that atleast I have learnt basic steps and statements for PROC SQL. Could you be so kind to share codes for joints as well. It is better, let the students try then provide the answers. VERY NICE AND HELPFUL MATERIAL, HOWEVER I SEE ONE CORRECTION, WHERE CLUASE CAN REFER A COMPUTED VARIABLE USING THE CALCULATED KEYWORD. Yes, your understanding is correct. We can use CALCULATED keyword in WHERE clause. Please make a note that the CALCULATED keyword in WHERE clause is not a standard SQL. It’s SAS SQL, which is unique to SAS. Hence i don't recommend to people who are novice to SQL programming. very informative post.Easy to understand for learning SQL. so useful information to have an idea about sql. it also helpful for quick reference toooo. Thank you so much for this exposition and explanation. Well done!!! Great lesson! Thank you so much! in this code it is not removing duplicate values in the whole dataset.why? Thank you for your post! Very useful and helpful information for a beginner like me. inobs is for no. of obs to fetch from a table while outobs is no. of obs to insert in a table. Thank you for this great tutorial. Can I practice these Proc SQL statements/code with a regular SAS dataset or do I need to use something else? Thanks! How i am unable to get SAS data set used in this exercise.. Could you please help me..? Its very helpful. Thank you Admin. Can anyone tell..what is more efficient order by or proc sort? Thank you. Great information about SQL. It helps me a lot. In 16)Counting unique values by a grouping variable example, how can count(distinct score) give number of students who got same scores?